As the Vancouver Real Estate market heads into the dog days of summer it is desperately trying to shake an abnormally sluggish first half. 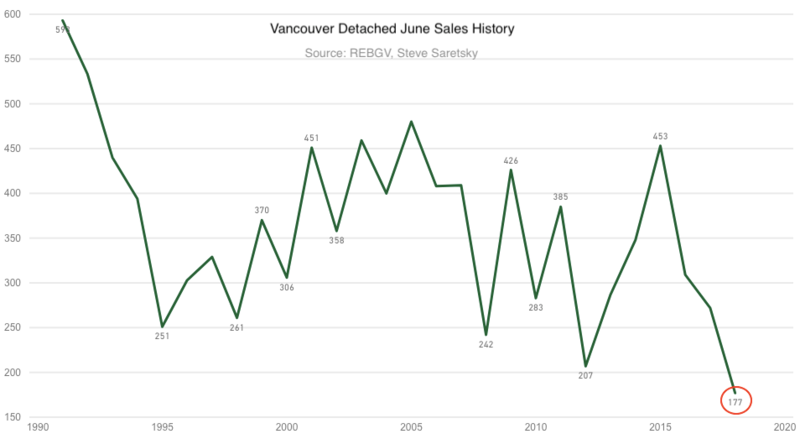 To suggest sales have been weak might be an understatement, Vancouver detached housing sales have fallen to a 27 year low in the month of June. Home sellers and Realtors remain relatively confused and unsure when this storm will pass. Many have chosen to take their home off the market and try again at a later date. This is probably why we have seen new listings start to dwindle as we experienced following the foreign buyers tax back in August 2016. New listings for the month of June tumbled 29% year over year, down to their lowest total in thirteen years. Vancouver Detached New Listings for June. Despite new listings declining, for sale inventory still moved higher, increasing 8% year over year. It jumped to the highest level for the month since June of 2012. This is in large part due to historically weak sales. 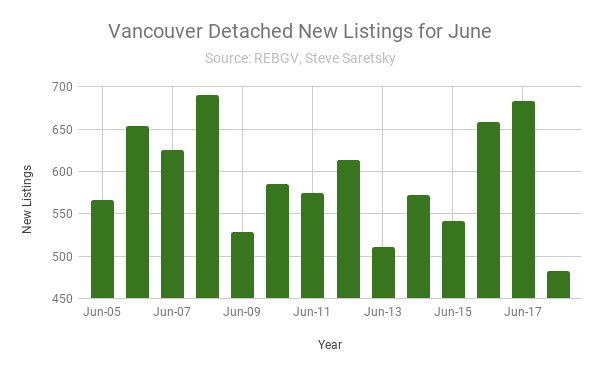 There were just 177 sales in the month of June, this marked the lowest total ever recorded dating to 1991 when the Real Estate Board of Greater Vancouver began compiling comprehensive market data. This marked a 35% decline on a year over year basis. Overall it’s a mixed bag on prices, the median sales price dropped 1% year over year, while the average sales price dipped by 5%. Entry level detached homes continue to hold up better than the luxury side of the housing market. Luxury homes have experienced price declines in the double digits with foreign investment drying up and tighter lending conditions factoring in. More market stats can be found here.